We're forecast to get three or four inches of snow over the next 48 hours and with the ground now frozen and temps staying below freezing, it might be the last we see of our lawn till spring. That time of year, for us. Errands, today, one being a trip back to the bike shop with my single speed Pugsley for a gear change. My bike shop guy switched out the rear cog while I waited. Can't beat that. Probably could have done it, myself, but lots of little washers to get right on single speed conversion like this. He showed me how it's done, though, so I will probably go it on my own if need be, next time. Changed to a slightly higher gear ratio. Not much, mind you, but even a little change is important when going ss for trail work. When you need a quick burst of speed, you can't afford to spin out, but you can't afford to under-spin, either, by being in too high a gear. Got to get it just right. Anyway, got home, mid-afternoon and, of course, went right to work on the trails with 5 plus miles of laps. Yup, got it just right, now. Decided to take a little recovery ride in the dark this morning. Went out about 5:30, or maybe a bit before. It takes so long to get ready for a cold, dark ride, despite laying out and charging everything last night. I did the flattest ride I can, with no add ons which have hills, about 10 miles. Felt great on the way out, but coming home, my legs felt tight and my average was quite low for this ride. I wore the new Nox Gear safety light vest we got on sale. I can't really describe it, but it's very cool, with multiple flashing colors to choose from. There's a light (pretty big) on your back and very thin plastic tubes you slip your arms through that also light up. There's just one very light weight clip in the front that holds it on. I noticed cars staying far away. It's very busy on Main St from my street until they all get onto the highway, about 2 miles, so it was a good test. It's so light, you cannot even feel it. Might have to check out that vest. Thanks. Been such a long time since I've ridden in the dark, but was a daily thing, back in my commuting to work days. Some of those early morning in the dark rides before the traffic built up were quite pleasant. Not all of them, of course, but have good memories of some of them. Well, I am not riding in city traffic, but it's considerably busier than in the last 2 places I lived. However, it's really only when I do this ride. Sometimes, I just want to be outside on a flat road. I didn't see any other riders today, which was weird, as it was not that cold (42) and there's a considerable number of clubs that ride out this way, as well as commuters. The good thing is, it was almost fully light when I got back at 6:15. We got our snow, today. Not a lot, about 3". 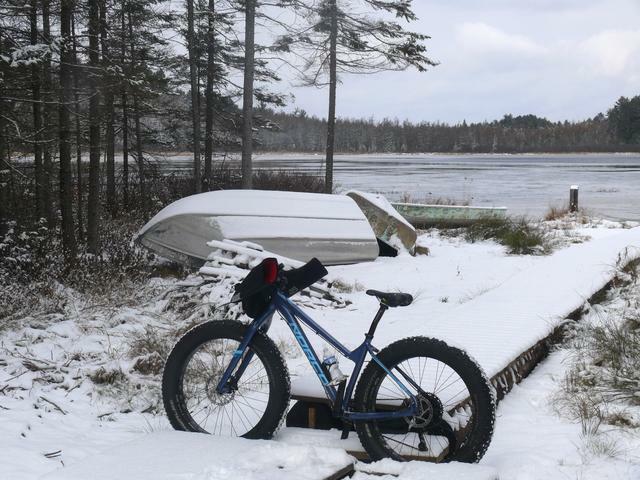 Still, it was enough to have a real snow day of fat biking on the Norco Sasquatch (great bike). Got out on our neighborhood roads before they were plowed and did 6 miles. Doesn't sound like much, I know, but remember this is pushing a fat bike through the snow. Good workout, anyway. Got back home and then did 4 more miles, this time on my trails, with Star keeping me company, as usual. No thaw in sight, so good chance I won't see the grass on our lawn till late April or even May. We had winds, with gusts up to 40-50 mph for most of today, so no riding. I went to a new class at the gym; thought it might be awful, but it was fun and similar, but different enough from what I do in the early AM. It's at 11 AM, a bit late for me, if I am not doing something outside on a weekend. I didn't have any other stuff to do until tonight, so it was not an issue today. So, if I can't ride, x country ski, snow shoe, or hike, I have something to do. DH went for a walk, but I am sick of that, except on my easy/rest days. A little more snow, today, maybe a little more, tonight, then a a mostly dry week, next week. All in all, not bad. Can still ride both our local roads and my trails. The roads may clear enough to allow me to ride the skinnier tire bikes at some point. Hope so, because I don't want to mothball them, yet. The trails, though, are likely to be fat bike, only, for the rest of the winter, though. Not much melting back in the woods. I may be able to also ride the Krampus with its 3" tires when I get enough hard pack from riding over the trails a lot, but not going to take chances. Be dumb to take a fall because i wasn't riding a fat bike. Today, all riding, road and trail, was with the single speed setup Pugsley. Very pleased that I'll be able to ride it all winter, except when the snow gets deep and slushy. Gearing is just right for hard pack snow. Don't want to give up my single speed riding till spring. That would drive me nuts. We had a beautiful sunny day today, so we forced ourselves to get out there and ride. I am glad I did. Did the longer version of my early morning rides, 19 miles. It was actually warmer than I thought, as the weather was showing some wind still around, but we couldn't feel it much, as we had a tailwind going out, but then kind of a persistent and annoying crosswind on the way back. I was overdressed, but not horribly; I decided to wear my winter jacker with the pit zips, so at 9 miles, I unzipped them and pushed my head cover a little up on my ears. It was not necessary for me to be wearing my Ibex tights, but that did not bother me. Every ride now until the roads get sloppy is a gift, so onward. It's going to be a high of 34 and a low of 19 on Wednesday and I am not sure if I can handle the group ride if it's in the low 20s at the start. it's going to be hilly, so I'd get warm quickly, but we will see. So right about every ride on dry pavement now being a gift. Looks like I'm done, barring an unusual thaw. More snow, last night, almost 3". The plows haven/t been out all day, so probably be tomorrow before any serious road cleaning happens. I did take out the Norco fat bike with the heavy duty studded tires for 5 miles around our local roads. By staying in the tracks of cars, managed some good speeds, in fact. I then had a try at clearing a path through the snow on my trails, but gave up, disgusted and frustrated. Promised myself, this winter, that I wouldn't work like a dog to keep my trails open to biking, again, the way I did last winter. That was just too much and no chronic neck discomfort like I have, now, either. I did ride the fat bike though the fresh snow on the trails, but just a matter of time, now, before it gets too deep for snow biking. Then it's out on the roads for my snow biking after the plows have done their work. What I AM going to do, this winter, though, is just let it snow and use the skis and the snowshoes on the trails. I'll mix that with some snow biking out on the roads and (ugh!) maybe some indoor trainer work. Should be able to stay in shape though the winter. That, and the skis and snowshoes will give me a positive outlook on snow when it comes, instead of a negative one as per trying to keep my trails open all winter. Overnight lows now in single digits and about 5" of snow on the ground. Yup, still riding, snow and cold, notwithstanding. Same old crazy me. No new snow, now, for a couple days, so have been riding my trails enough to pack down the snow and get a good base. As long as I stay in my narrow "single track", I do okay. No techy turns or fancy stuff, now, but as long as I stay on the straight or gently curving sections, I'm safe. Also doing some pavement riding on our plowed roads. All fat bike stuff, so far. The single speed Pugs is doing better than expected as a snow bike. Getting a lot of use from it, more than expected. Probably the end of my single speed skinny tire bike riding, now that winter is here, but at least I'll still be able to go single speed, thanks to the Pugs. Last edited by north woods gal; 11-13-2018 at 12:01 PM. Like I said, I'm a little crazy. We're getting snow Thursday night. It will be melting by early AM, but still. I hope it doesn't affect my plans for a nice Saturday ride. I don't think I can force myself to get to the group ride tomorrow. It will be around 25 at the start, with a lower real feel. Lots of wind. I think it will be fine for Saturday. Any snow we get will be washed away. Hope it works out for you, Crankin. Our weather continues to be cold, but at least we've had a little sunshine. That does help my mood, at least. 13 miles, today, all on the fat bikes, including 10 miles of riding on our snow packed roads and anther 3 on my equally snowy trails. To be safe, did the roads on the fat bike with studded tires, since the snow is packed down very tight due to a couple of days of traffic. Probably would have been fine without the studded tires, but just felt better to be safe than sorry. You know, even after all these years of riding on snowy roads, I have to winder what people think when they see my pedaling on by. Our neighbors that know us think it's pretty cool for me to be out riding, no matter what, but I'm sure some strangers think I'm a little nutty. Oh, well. I did the trails on the Pugs, after I got back from my road ride. Was nice to ditch the studded tires for the smoother rolling tires on the Pugs, plus the Pugs is a single speed, now. Hard to explain why I prefer going single speed, but I just do. We had about 4 inches of snow from about 8 PM last night to about 2 AM. It turned to rain, but when I woke up at 4:30, I couldn't face going out to clean off my car (the down side of living in our condo). I don't even know if my class at the gym was actually held at 5:30, but since I have felt kind of off since Wednesday, I decided to sleep in. I plan on lounging around all morning, the perk of working part time, and then going to a yoga class, where I will be among the youngest in the room! Then, off to buy food for Thanksgiving. Tomorrow's forecast is predicted to be 49 and bright sun, so I hope the roads are ok. They are already fully plowed, but I am hoping the rain washes away any slush or salt in the shoulder.